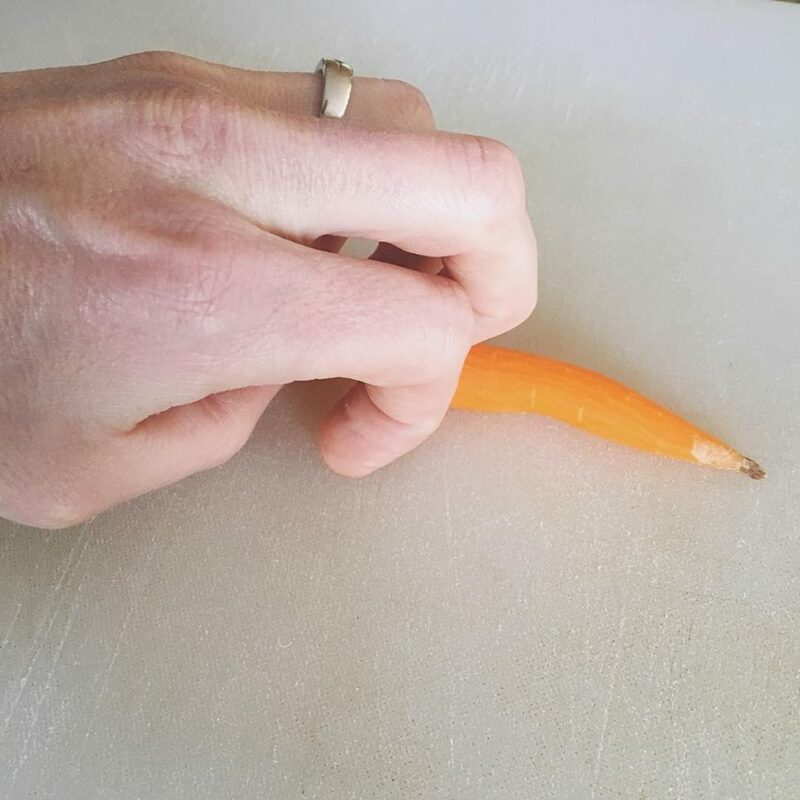 What do pencil grips and animal paws have to do with knife skills?! 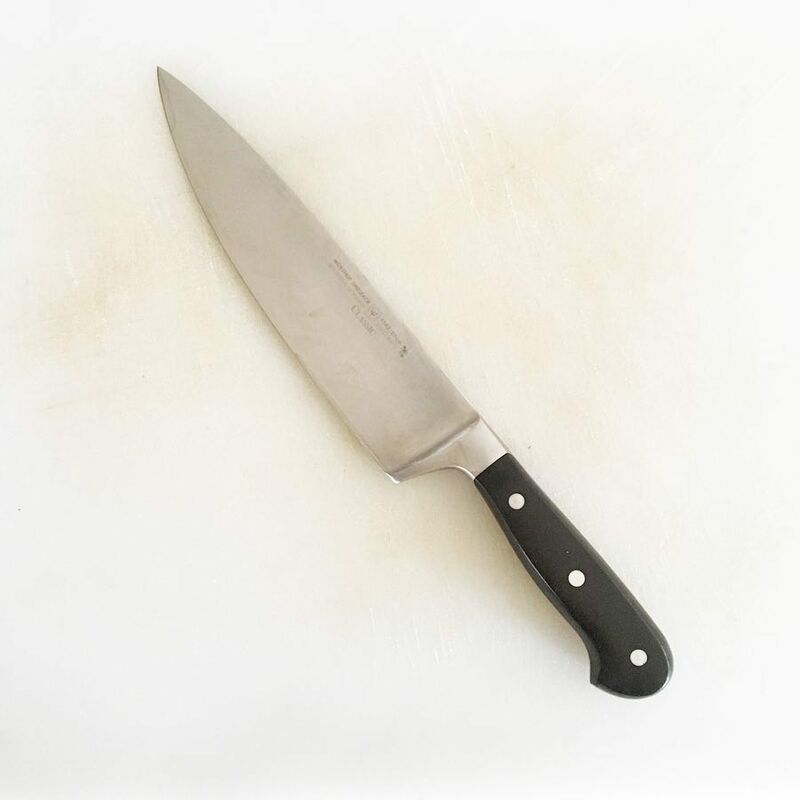 I received an email recently with a question about how it is that chefs can chop things so quickly. I’m sure you’ve seen it: a culinary professional staring down at some unsuspecting onion, wielding their knives with mind-blowing speed, rhythmically pounding on the cutting board like a woodpecker, producing a stack of thin, uniform slices in a matter of milliseconds. Now I have to be honest: chefs who can pull it off are pretty impressive (I’m talking to you, Sam), and being able to slice quickly and consistently can drastically reduce your prep time. So what’s the trick? The answer is kinda boring: practice. I’ve been playing the guitar since I was about 17 years old. When I was just getting started, my fingers fumbled around the fretboard trying to find their place. It took a while before I could play the chords without constantly looking down at the frets. Once I got comfortable with chords, I eventually moved on to playing some lead guitar riffs and improvisation. I’m no Jimi Hendrix by any means, but I’ve gotten to a point where my hands go where they need to go almost without thinking. The same probably goes for you and nearly anyone with a computer or mobile device when it comes to typing. Whether a keyboard or a touchscreen, after having practiced the proper technique over and over again, you can communicate electronically almost effortlessly. Your fingers (or thumbs) know where to go and what to do. Using a knife is no different. The trick to being able to slice quickly is to first know how to slice properly. It’s all about learning form and technique - teaching your hands where to go and what to do to accomplish the desired ends. Technique is really the key here: if you start by practicing the proper technique, the speed will come naturally in time. so what is the proper way to handle a knife? 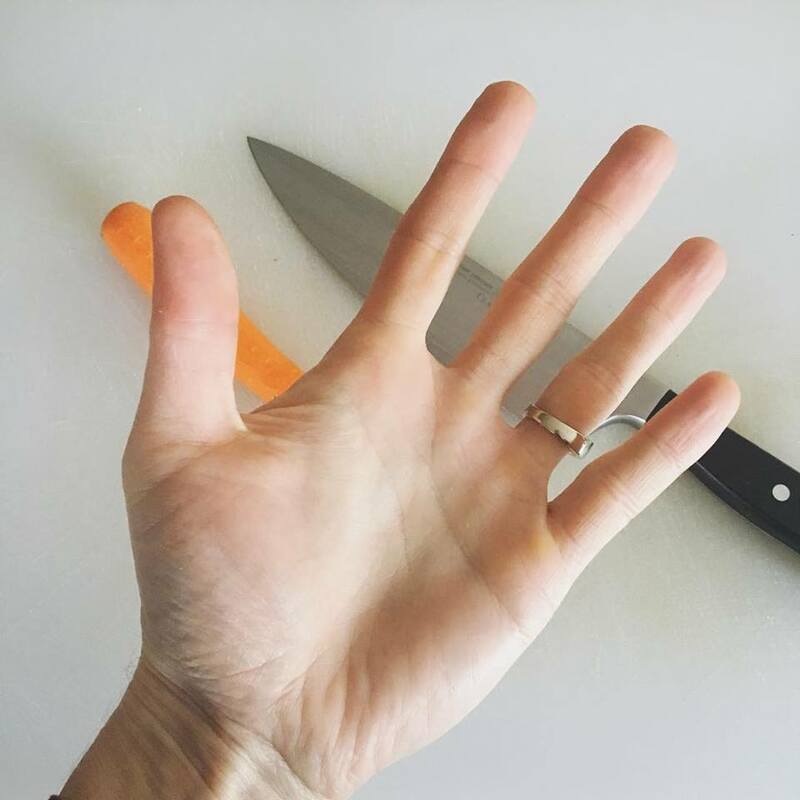 Your success in using a knife - chopping or slicing consistently and effectively while minimizing risk of injury - centers around where you position your hands. 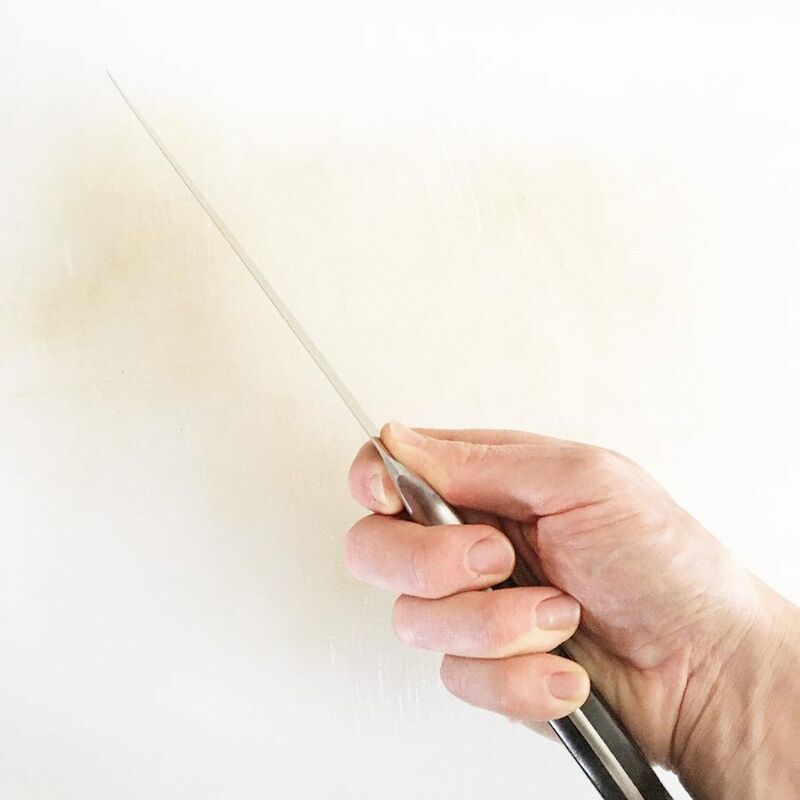 I go over this with the participants in every one of my hands-on kitchen sessions (even those not specifically geared toward knife skills) because it is so incredibly important (and because many people have already formed bad knife habits that are hard to break). Let’s break it down one hand at a time. a finger on top for extra…? 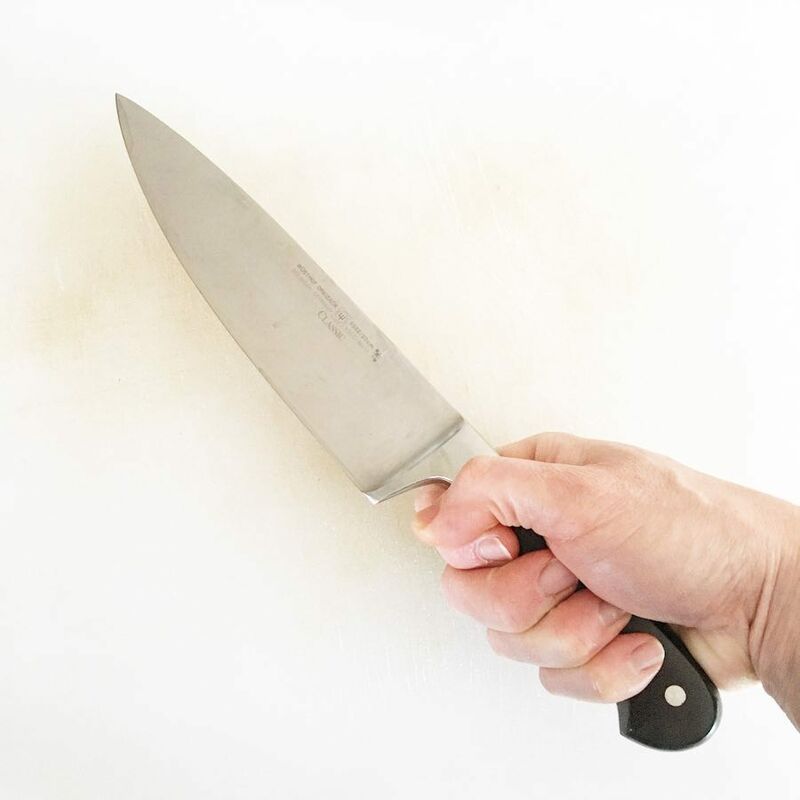 You may be surprised to learn that the best way to hold your knife for maximum control involves moving part of your grip off the handle and onto the blade itself. Take the thumb and index finger of the cutting hand and place them on either side of the blade just past the end of the handle (an area called the bolster, where the handle is attached to the blade). Much like holding a pencil, having a grip around part of the back or spine of the knife allows you better control and more stability. Next, wrap the remaining three fingers around the blade for a firm grip. It will probably feel weird at first, and you may start to get a little sore on your palm near the base of your index finger. That is common and gets better with practice. 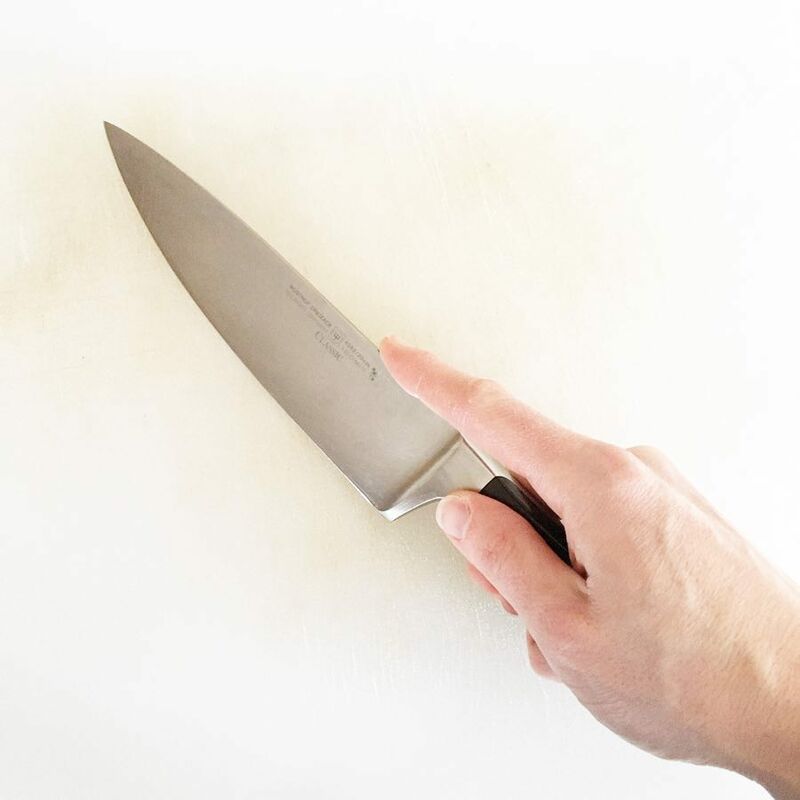 Once you start using this grip, I am sure that you will feel more confident using a knife. …then you gotta stop doing this! The hand that is gripping the product on the cutting board has a very important job: to hold the item in place without getting cut. Again, proper technique is key to safety and consistency. 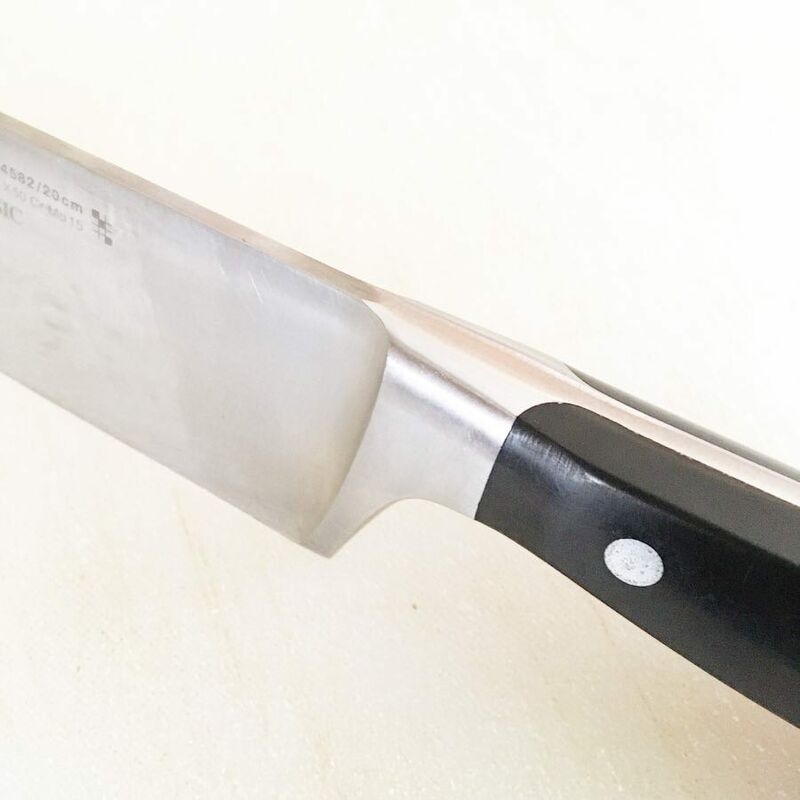 Then there are the people so afraid of the blade that they hold the product clear on the opposite end, giving them little to no control over the product or the consistency of the slicing. or Panther Paw or whatever your school mascot happens to be. Start by curling your fingertips back into a sort of bear claw (or other ferocious animal of your choosing). Keep the tips curled back as you press the hand over top of the item to be sliced. Not only are your fingertips hidden from that sharp blade, but now you can use your knuckles to guide the blade to where it needs to go. Just be sure to keep your thumb tucked back and away, and don’t let it sneak out from underneath. If you want to be spending more time in the kitchen preparing fresh, satisfying meals for you and your family, there is no better place to start than to get comfortable with using a knife. Nearly every recipe involves some sort of knife work, and the sooner you start doing it the right way, the easier it will be to train your mind and your muscles to do it safely, consistently, and more quickly so that you are getting the most out of your time in the kitchen. I realize, now that I’ve gone to all the trouble of taking photos and typing instructions, that this would have been much easier as a video demonstration. Perhaps I’ll get that filmed this week. In the meantime, let me know if this has been helpful and what other kitchen questions I can answer for you. Leave your comments below and be sure to subscribe to my email list for more helpful hints. You also need the right tools. Need some help finding them? Check out my gear page!